I don’t normally buy hand wipes but with the impending arrival of the grandchildren I thought it wise to have some handy. As I walked into the store without any particular brand in mind and passed through the salad dressing and condiment aisle, I stumbled on a display of Wet Ones® that caught my eye on two levels. First, why would someone display wipes with mayonnaise and Italian dressing? Second, the extremely cute and fresh package designs made the product stand out like a wickedly sore thumb. The container is a conveniently smaller size that fits in my purse, in the drink holder of the car, and on the counter at home. The packages are offered as limited edition hand wipes distinguished by three varying background patterns and color palettes that are tailored to three scent options. The colors very tastefully support the playful approach to the background designs, and subtle colors reference the fragrance formats. From an impact standpoint, the new package design is a breath of fresh air that takes the “same old same old” out of the plastic canister hand wipes category. I would love to see these background designs continue to evolve as the seasons change, which would provide the opportunity for the brand to stand out and be continually new in the minds of consumers. With that said, I did find several incongruities in the package design. The longer I looked at the three packages, the more I had a feeling of subtle conflict between them, and upon closer examination I discovered that the brand, priority and formatting of messaging varied between the three package styles. On two of the three cartons the copy and color change, but the design grid remains consistent and yet allows for ancillary messaging without breaking down the grid. 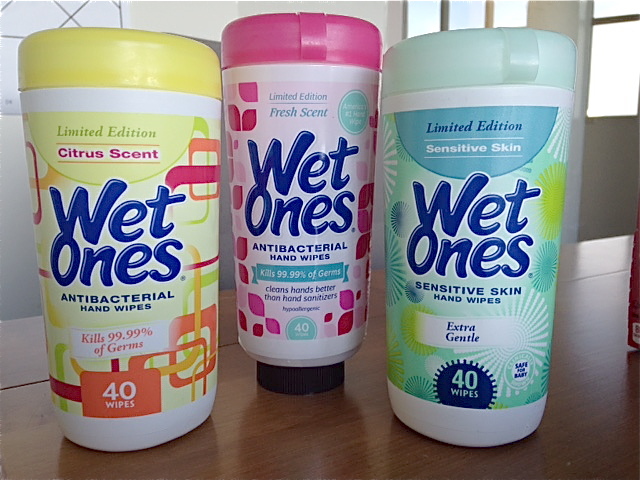 On the third package the Wet Ones brand is larger, the limited edition communication is formatted differently, and the size relationships of copy and content stray pretty far from the standard used on the other two packages. The result is a package that is out of visual sync for no apparent reason. With very little effort, the three products would have had greater unity and impact if they had a consistent brand presentation across all three packages. I love what Wet Ones started, and I hope that they will continue with this creative approach that does to hand wipes what has been done to baby wipes – elevating a utility product to the level of accouterment with an effective package design. There is no reason wipes have to be boring and Wet Ones has clearly shown how to change things up with designs that stand out and draw focus to the package. Keep the designs coming!